At the base of your brain, where all the nerve endings come together to form your spinal cord, there is something about the size of your thumb called the Reticular Formation. This is a real physical, physiological thing. 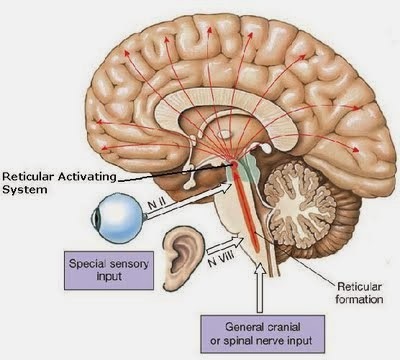 Part of the Reticular Formation is the Reticular Activating System (RAS). The RAS has one job and one job only. Its job is to filter information; and it is superb at what it does. We are constantly exposed to, and bombarded by so much information, data, stimuli and even opportunities, that if we consciously tried to register it all, process it all and think about it all, we would literally go crazy. We would be in a constant state of "overload". So the RAS (which remember, is VERY good at what it does) constantly filters out "extraneous" and "superfluous" information and data. It's like a "Spam Filter" for your mind. 1. Is it my responsibility? 3. Does it match my version of 'the truth'? Whatever information, data or stimuli you are exposed to must satisfy all three questions. It's not the best two out of three. It is not a democracy or majority rules. It must satisfy ALL THREE criteria before the RAS will allow you to be aware of it - that includes any opportunities that you come across. Lets look at the first question the RAS asks to see why you may have blind spots and can't see opportunities that are all around you. 1. "Is it my responsibility"? - Have you ever gone someplace you've never been before, in an unfamiliar part of town, as a passenger in someone else's car? After you got there did you realize that you had absolutely no idea how to find your way home? It has probably happened to most of us. On the other hand, had you driven there yourself, would you have been able to find your way home? More than likely. Why in the first case were you clueless, but in the second case you noticed the gas station on the corner, the white picket fence, the church steeple and all the other landmarks that would help you find your way out of there? Because, in the second case you knew you were responsible for getting there and back. However, in the first case you knew you weren't responsible, so your RAS decided you didn't need that information, filtered it out and you never saw the important landmarks that could help you find your way home. The "Mom Factor"
I would like all of you mothers reading this to think back to when your first child was an infant (I'm sure the following was true of all of your children, but think especially of your first child). They were just old enough that they had graduated from the bassinet by your bed to their own crib, in their own room down the hall. The first few weeks do you remember how you would be sound asleep in the middle of the night, and out of a sound sleep, all of the sudden you knew that you had to be down the hall checking on your child. You don't know what you heard; you're not even sure that you had heard anything; you just knew you had to be there, and in a heart beat you are wide awake and at that child's bedside making sure that everything is OK. It's the third time that night that you have been up to check on your child. As you return to your bed, you decide that it is important for your husband to know that THIS! - IS! - THE! - THIRD! - TIME! that you have been up to check on HIS! child. So, you THROW! yourself on the bed and JERK! the covers back over to you, just to make sure your husband appreciates that this is the THIRD! time you have been up ? and your husband sleeps through the whole thing. He never heard you get up, was never aware that you came back to bed, and never even felt you jerk the covers back over. Now, in some of your homes, later that night, the family dog starts yapping in the back yard. Dad jumps out of bed, throws open the window, shouts at the dog to shut up, comes back to bed - and Mom sleeps through the whole thing. How is it that Mom can hear a virtually inaudible sleeping baby, but can?t hear barking dogs and Dad can hear dogs, but can't hear babies? It's simple ... in your home the roles have been defined such that Mom is responsible for the baby and Dad is responsible for the dog. Your RAS will filter out any information that you are not responsible for and make you unaware of it. I've often heard it said that wisdom comes with age. But, that is not true. The only thing that automatically comes with age - is old. That's all you get. Wisdom comes when you accept responsibility for your life. I know 80-year-olds with no wisdom and 18-year-olds with plenty. The difference is that the 18-year-old has accepted responsibility for their life and future, but the 80-year-old is still blaming everyone and everything around them for their stature in life. All of us spend the first nine months of our lives on a waterbed. It is warm. It is cozy. All of our needs were met without us having to do a thing. Then we are born, the doctor cut the umbilical cord, slapped us on the rear end and then 95% of us spend the next 50 years of our lives looking around for someone else we can plug our umbilical cord into to take care of us. But, it's not someone else's responsibility. And until you take responsibility for your life and future, your RAS will make you blind to opportunities around you.